This monument, made by Lawrence Macdonald in 1850, is one in a series of dynastic monuments to the Finch family. Lady Winchilsea (1809–1848) died prematurely, and is portrayed in an elegant neo-classical style, the poetic inscription evoking the pathos of her early death. The sculpture was executed by the Scottish sculptor Lawrence Macdonald, who trained in Edinburgh, but spent most of his adult life living and working in Rome. He exhibited regularly at the Royal Academy in London, and at the Royal Scottish Academy in Edinburgh. He also showed works at the Great Exhibition of 1851. Prince Albert was one of his patrons, and he executed ideal sculpture for Osborne House on the Isle of Wight. 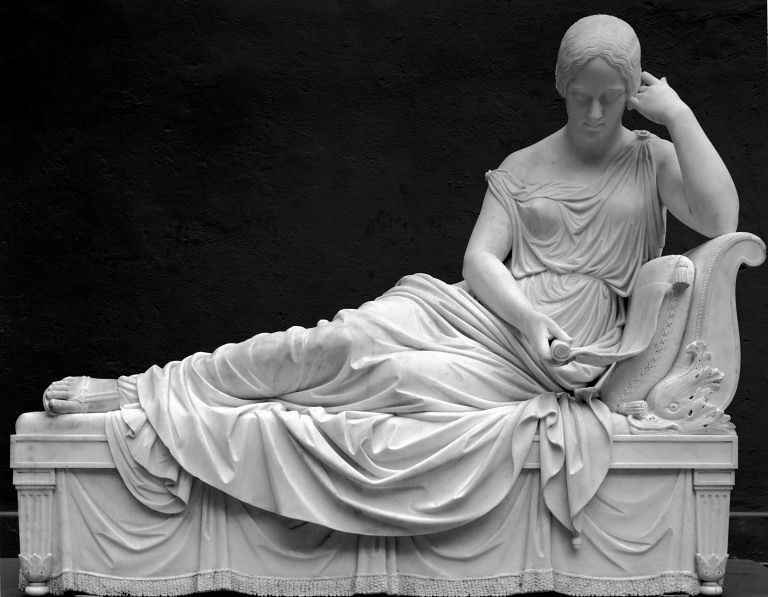 This monument is one of his most highly regarded sculptures, and exemplifies the classicising style in sculpture, which continued well into the mid 19th century. Other monuments to members of the Finch family once in St Mary's Church, Eastwell, Kent, are now housed in the V&A. The church sadly fell into disrepair and collapsed in the 1960s, but the monuments were rescued and brought to the Museum at that date. In addition two busts of great-grandsons of Sir Moyle and Lady Finch, Daniel Finch and his brother, Canon Edward Finch, are also displayed in the V&A. 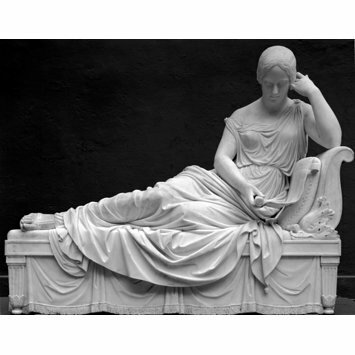 The effigy, in white Carrara marble, is reclining on a classical day-bed. She wears a loose robe and is holding a scroll of paper on which reads: 'I AM HAPPY INDEED HAPPY IN THE WORD GOD IS WAITING FOR ME.' The bed is raised upon a high marble base. Inscribed, signed and dated. This object is from the ruined church of St. Mary, Eastwell, Kent, the south porch. Given by the Rector and Church wardens of the Parish of Eastwell with Boughton Aluph in 1969.